There has been a tiny biochip in the US developed to be injected into the body to monitor alcohol levels over a prolonged period, with the aim of supporting patients in substance abuse programs. 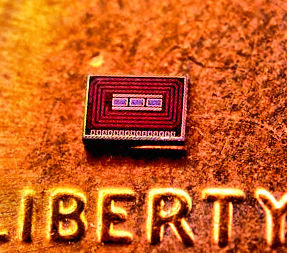 The chip has been developed by engineers at the San Diego Jacobs School of Engineering, and can be implanted just under the surface of the skin and is powered wirelessly by a wearable device, such as a smartwatch or patch. “The ultimate goal of this work is to develop a routine, unobtrusive alcohol and drug monitoring device for patients in substance abuse treatment programs,” said Drew Hall, an electrical engineering professor at the UC San Diego Jacobs School of Engineering who led the project. “A tiny injectable sensor—that can be administered The Chipin a clinic without surgery—could make it easier for patients to follow a prescribed course of monitoring for extended periods of time.” The chip itself contains a sensor that is coated with alcohol oxidase, an enzyme that selectively interacts with alcohol to generate a byproduct that can be electrochemically detected. The electrical signals are transmitted wirelessly to a nearby wearable device such as a smartwatch, which also wirelessly powers the chip. Breathalyzers are one of the most common ways to monitor blood alcohol levels, but are clunky, require patient cooperation and can be inaccurate, Hall noted, while a blood test is accurate but requires the expertise of a trained professional. “We don’t want the chip to have a significant impact on the battery life of the wearable device. And since we’re implanting this, we don’t want a lot of heat being locally generated inside the body or a battery that is potentially toxic,” Hall said. A provisional patent on the technology has already been filed, and researchers have tested the chip on pig skin, with plans to extend trials to live animals in the future.